Do you love your iPhone 5? Of course you do. But I’d guess that you don’t love paying for shipping when ordering products online, right? Also not shocking. Well, what if I told you we want to help you love your iPhone 5 more, and pay less for shipping? Is it safe to assume you’d be interested in that? If so, head over to our iPhone 5 category page right now where you can save 10% off EVERYTHING, like our hit Wireless Bluetooth adapter, dockBoss air, our new perfect-length Lightning charge & sync cable, the Lightlinez XS by Kenburg, and more! Plus, if you live in the US and your order is over $35, you’ll qualify for FREE USPS First Class shipping! Double the savings? Can’t beat that! But act fast, sale ends June 6th, 2013. 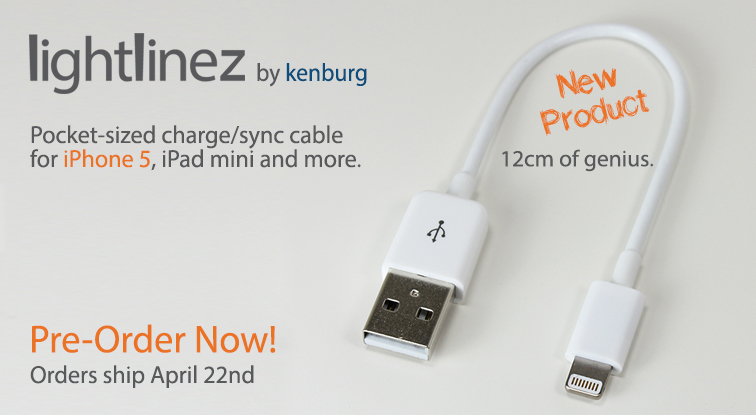 Lightlinez XS for iPhone 5, iPad mini & More: Pre-Order Now! CableJive is excited to announce that we are now taking pre-orders for the Lightlinez XS (made by Kenburg). This short, 12 cm charge and sync cable for iPhone 5, iPad mini and all other Lightning-equipped iDevices is the perfect length for most everyday situations. At home, it’s just enough cable to sit neatly by your computer or laptop. On the go, this cable is small enough to slip in your pocket, purse, or computer bag without getting all tangled up. Never wrap your cord in vain again. It’s available to pre-order right now, with all Lightlinez XS orders shipping out on April 22nd. But you’ll want to get your order in right now, because for today only (April 9th, 2013), we’re offering FREE USPS first class shipping on our webstore at www.cablejive.com, so if you get your order in today, it will ship free on 4/22. Don’t miss out, order now! *Free USPS First Class Shipping is US only.